FPJ's "Ang Probinsyano" is still the top-rating undisputed Primetime TV series for one year now! And yes together with "Doble Kara," the said Kapamilya action-drama teleserye is now the longest-running TV series today with a span of more than one year! 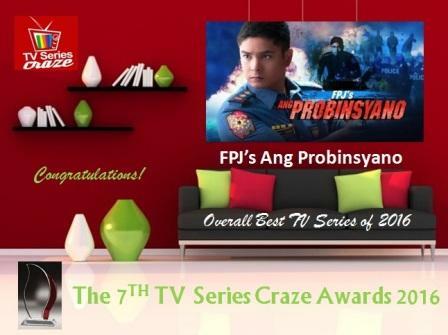 Therefore FPJ's "Ang Probinsyano" truly deserves to be our Overall Best TV Series of 2016 here in our very own, The 7TH TV Series Craze Awards 2016. FPJ's "Ang Probinsyano" which is led by the Primetime King Coco Martin is also our last year's Best Primetime TV Series. Because of its per chapter story that focuses on different crimes and teaches the public to be aware of different modus operandi, the series was extended up to more than one year now! The success of the teleserye which is also clearly seen in the nationwide TV ratings battle beating many of its rival TV programs from the different networks was also brought to the big dome! FPJ's "Ang Probinsyano" had its thanks-giving concert months ago supported by many of the big stars who attended the concert. This hit Kapamilya TV series already featured most of the big stars as guest casts in their stories including Cesar Montano, Anne Curtis, Paolo Avelino, Vice Ganda, Cherry Pie Picache, Carlo Aquino, Michael De Mesa, and Angelica Panganiban to name few. The teleserye also gives rise to now's breakthrough child stars Onyok and Awra who now lead on their hit blockbuster movie "My Super Parental Guardians" with Vice Ganda and Coco Martin!